Get ready to travel to far-off fantastical worlds without leaving the comfort of your couch. Starting right now, PlayStation Store offers discounts of up to 80 percent on games inspired by fantasy and science fiction, including Dragon Age Inquisition, Divinity: Original Sin, The Witcher III, and much more. Have a great trip! Check out the full lineup below, but don’t wait too long – PlayStation Store’s Otherworldly Flash Sale ends Monday, August 22, at 8 AM Pacific Time. A few good things I might have to splurge on. Most of the games I have played already though. Yes 2 of the 3 games in the promo picture were free on PS Plus already. Damn. That is one ****** sale. Not a single thing to buy. So disappointed. Unless you’re an RPG fan, at which point there’s a ton of good stuff here for sale. Not much but I’ll make sure I get Witcher 3 and Bastion. Some good PS4 stuff. Bravo! Dark Cloud 2 but not 1? Odd. I mean, it’s the better game, but that’s still weird. Crysis and Another World for me. Always wanted to play the Crysis series from the beginning which isn’t available on disc and Another World, I could never get past the first scene way back in ’91 at my local arcade, great sale! Lately, it seems to me like we’re getting the same games on sale over and over. I’m personally underwhelmed. Ooo good price for MEGADIMENSION NEPTUNIA VII!! Find out next month! On an all new disappointing month of discounted indie games! I know what I’m getting! When you click on “full lineup” above, the link doesn’t work. Not impressed. These games have already been on sale for cheaper in previous flash sales. Me neither. I was hoping for some new titles. Will these have any Plus Discounts or are these the final price? Otherworldly sale and no Alienation? Damn shame. Saturday morning rpg, welcome to my backlog! no gravity rush remastered? another otherworldly game? Hmm saved a twenty for the flash sale i was hopeing for better but now its a choose between Resident Evil 4 pre-order or the prototype bundle hmmm. A lot of good games for a great price but I have 98% of them.Gotta say that if this sale was PS4 only it would be a terrible sale cuz there is nothing but recicled games and Plus games on the list lol.Witcher 3 is the best deal there $25 is basically paying nothing for it. It’s always about the wait for the next Flash Sale but this one is disappointing for me,believe its the 1st time there are so many games on the list and I can’t look and say “I’m definitely getting this one”…to a single game. Oh well wallet says thank you. The PS3 version of Dragon Age Inquisition doesn’t show any discount in the store. Didn’t this same thing happened a couple of weeks ago? Thank you for this sale . . . . . .
proteus and saturday morning rpg are must buys for me but is there a chance bastion could be a ps plus game soon? Not likely, because it was a PS plus game a year ago or so. Great game though. it has never been a ps plus game but i am considering buying it i loved transistor do you think i would like it? Great stuff! Some decent games in the sale. Although it’s not really a good flash sale that I hope to be in my book, it’s not that bad. However, it’s kinda weird that the PSone Classics PS3 version of Final Fantasy VII is on this sale but not the PS4 version. Oh well, I don’t even know what are the differences between the PSone Classics version on PS3 and the PS4 version, nor do I know which of these two versions I should get. Oh wait, I forgot. Final Fantasy VII is not on sale. Just V, VI, VIII, IX, and Tatics. Damn it. Dragon Age: Inquisition GOTY is cheaper than it’s ever been at only $16. Finally gonna grab it. As I own everything else in the sale that I feel is worth money, that one sale price makes this a success for me. Off-topic but I forgot to say…nice One-Punch Man ad on the top ha. Hey Guys, I would like to know your opinion on Geometry Wars 3 for ps4? I already have super stardust ultra. Do you think it is worth getting GW3D as well? I have it on Vita, but still keep considering it for PS4. I am not as big of a fan of the stage format that it has. A few months ago I actually bought a new 360 since I had traded mine towards my Xbox One, huge mistake on my part, but part of the reason why was Geometry Wars 1 and 2. I just love those games. As for Super Stardust, that one is more 3D, Geometry Wars is more flat. They changed it up with 3. I have really enjoyed both sets of games. If you just like flying around and shooting for the high scores, it is still more of that. Also Super Stardust has the stage format already. Less of a change if that is what you are used too. Witcher 3 is a lot better than Dragon Age, which is still a pretty good game. Your mileage may vary. I remember flash sales when I got digital games for $.99 and sub $5. I think the best game I got, not-played, was Crimes and Punishment. There was MK Arcade Kollection, Pac Man DX. I think I even unlocked my Demo copy of Double Dragon Neon for a nice price. These are the flash sales I miss and look out for. Bulletstorm is on there because it is a great game, completely unlike any other single player FPS before or since. The multiplayer was never even worth playing anyway, plus it’s not Sony’s responsibility since it’s not published by them and they have no control over it. If you’re that concerned, you should complain to EA; tell them to do the right thing like Rockstar did went Gamespy shut down. Grabbed a couple of games but I am underwhelmed by this sale. It’s getting to the point where I have money and want to spend it but the games I want or their dlc are never at the price I am willing to pay and only the same games keep going on sale. Thoughts on Bastion? I have 4 bucks in my account and I’m debating whether to get it or not. Did you like transistor? If so then it will tickle your fancy. Personally, I enjoyed Bastion more. Extra discount for Plus members? Anyone else having trouble with the flash sale tab on the store? What i mean is, everything in the store loads up fine. I go to enter the flash sale tab n theres nothing there. It seems to load fine on my ps3, just not the 4. 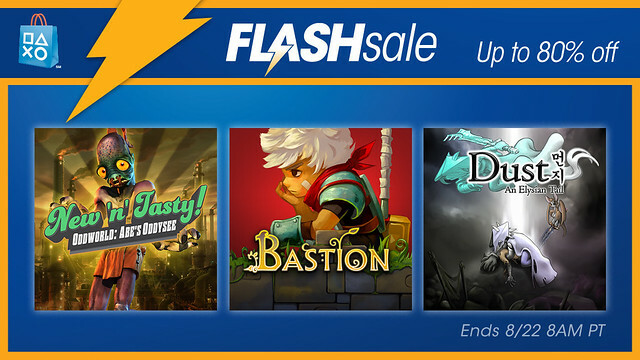 From Dust™ doesn’t appear with the other games on the Flash Sale and it doesn’t even show any discount on its own page. All the PSX classics are not being listed on the PSN store if you access it on a PSV; that should be fixed so people don’t miss on the chance to buy the games thinking they aren’t on sale~. Can you PLEASE fix the price for From Dust? It’s not showing the sale price! !